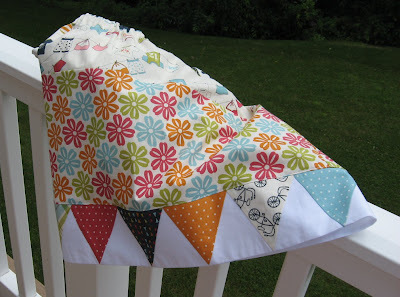 Hooked on Needles: Lucy's Crab Shack Leftovers ~ Made into something cute! Lucy's Crab Shack Leftovers ~ Made into something cute! In yesterday's post, I shared a couple of quilted tote bags that I made from one of Moda's newest fabric lines, Lucy's Crab Shack by Sweetwater. Both of these were custom orders, so they will not be showing up in my Etsy shop! I had a handful of charms and some yardage leftover from the bags. This skirt pattern from Moda Bake Shop had caught my eye when it first showed up in the bake shop a little while ago. 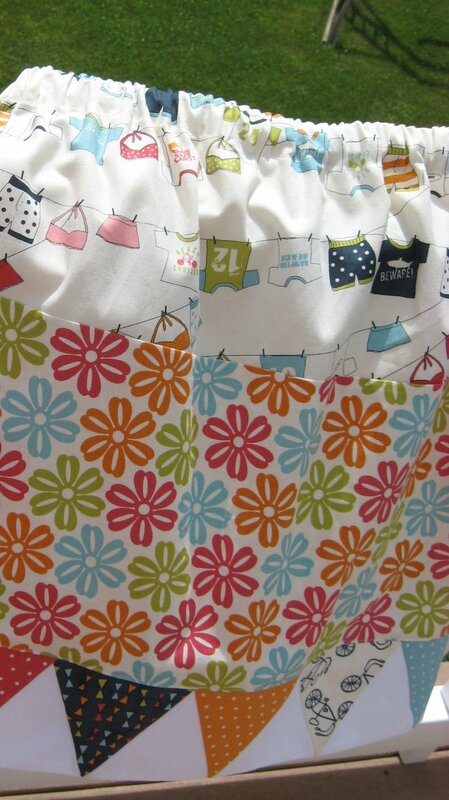 It's called Banner Day Skirt. So I made it using the leftovers from the bags for my 7 year old Grace who is such a girlie girl and loves to wear skirts and dresses! It was a pretty quick project too! The pattern over at Moda Bake Shop shows the skirt with just one fabric and the banner hem, but I didn't have enough of either bag lining fabric, so I used what I had left of both. Isn't that hemline just too cute? 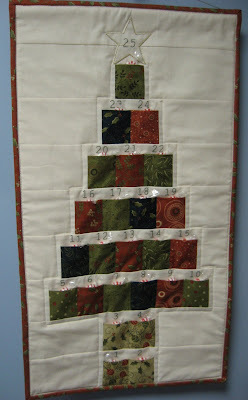 Triangles are not my favorite to sew, so I was glad I only had to sew together eleven prints and eleven whites! They turned out pretty well though, so maybe I shouldn't be so intimidated by triangles! This skirt pattern calls for a simple elastic casing for the waist which makes it super quick and easy to make. I think it was designed for a smaller size than my daughter, so it ended up more 'straight' than I had expected. If I make another, I would probably add another two print and white triangles to the hem band, and make the upper skirt section the same width as the hem band so there would be more fullness in the skirt. Once the skirt was finished, Grace tried it on and didn't take it off until bedtime! I guess she liked it! 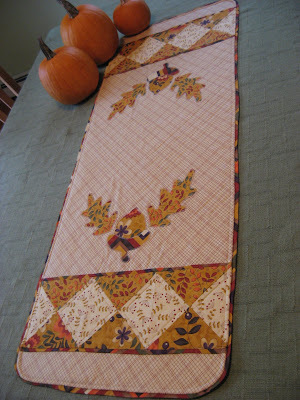 I've finished more quilts this week too, so I'll be sharing those pictures here soon! What a cute skirt - I bet you enjoy a little girl that is girly girly - they are so much fun to sew for. The triangle border on the skirt is really cute! 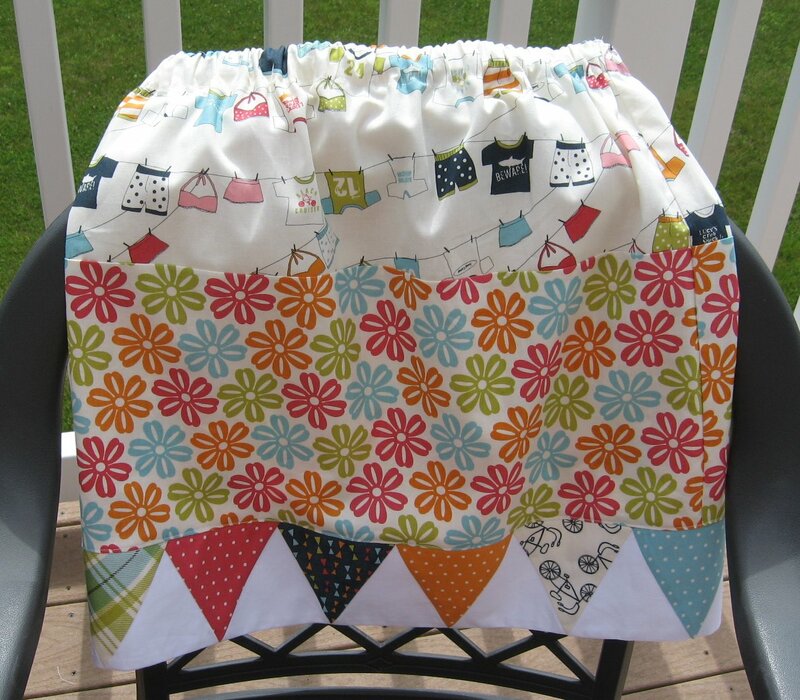 What a wonderful mom you are to make your daughter fun summer skirts to wear. Ooh it came out beautifully Mary:) Love it!! Lucy's Crab Shack Tote Bags ~ Summer in a Bag! Red and Aqua Quilt ~ Finished At Last! Red and Aqua Quilt ~ Finally Quilted! Jungle Animal Baby Quilt ~ Quick and Easy Gift! Modern She Made Swap ~ I Received My Gift!